24 Apr Natasha Tobias’ Rockin’ Reveal: A Before & After Transformation! It was just over a year ago when Natasha Tobias, owner of Natasha’s Wedding and Events approached us to help make over her home in Hampton. Her functional A-Frame house was fitted with high ceilings, plenty of natural light and a unique layout. And while it boasted impressive architectural elements, it lacked a bit in interior finish and polish. As an entrepreneur, Natasha’s busy work schedule made it difficult to find enough time to dedicate to her home. Having begun a renovation some time ago, the house was stuck mid-reno when she reached out to us. Two things heavily influenced our design process: Natasha’s love of music — sustained by her incredible passion and energy — and the fact that the home she shared with her two children and dog Chewey was a constant hub of activity (since the design was completed, her beau and business partner Paul, and his dog Hippy has joined the family unit). Because Natasha’s house was still under renovation, some of the house, including the entrance, had not been completed. A jumble of furniture from years of redecorating had accumulated in the Tobias household. It was clear that Natasha wanted to change things, and she didn’t hesitate to sell most of her furniture to make room for updates. 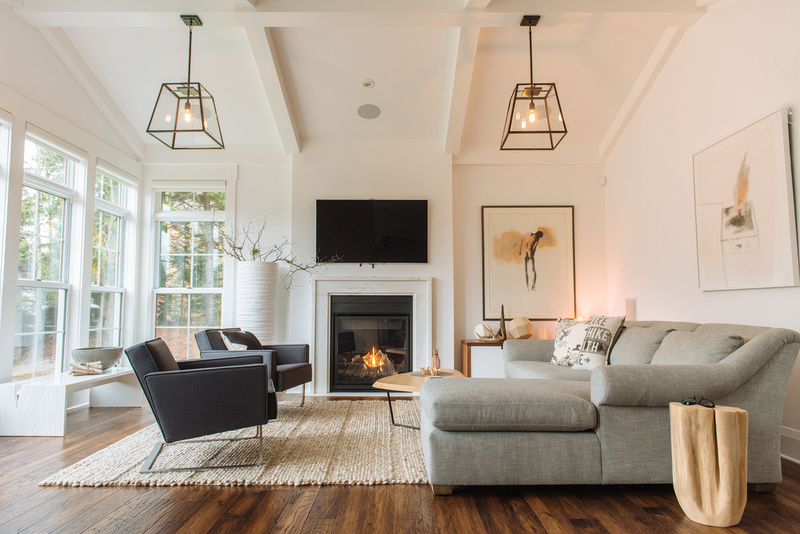 Even with the large windows and plenty of natural light, the living room felt dark because it was filled with heavy brown furniture and dominated by the brick surrounding the fireplace. The kitchen and dining area formed one room, right off of the living room. The lack of natural light, dark counters, inadequate lighting and beige walls provided the basis of the greatest design challenge. On the ‘bright’ side, the kitchen had recently installed cabinets and the flooring, though in dire need of sanding and varathane, was in pretty good shape. You can see the consequence of inadequate lighting, dark brown accents, and heavy furniture in the dining room. The loft overlooks the living room and it benefits the most from the home’s natural light. Surprisingly, this was one of the least used areas in the home; it was seen more as a transitional space than a potential living area. We took Natasha’s bright and bold energy, as well as her love for music, and turned her space into a physical representation of her life and her character. After careful planning and careful consideration to the family’s lifestyle, this bright and beautiful transformation was complete. Not one inch of this home goes is without its use; every detail of this design is purposeful. Covering over the heavy brick in the living room with drywall gave us an opportunity to add shelving for displaying personalized artwork, décor, and the essential chopped wood to feed the wood-burning fireplace. 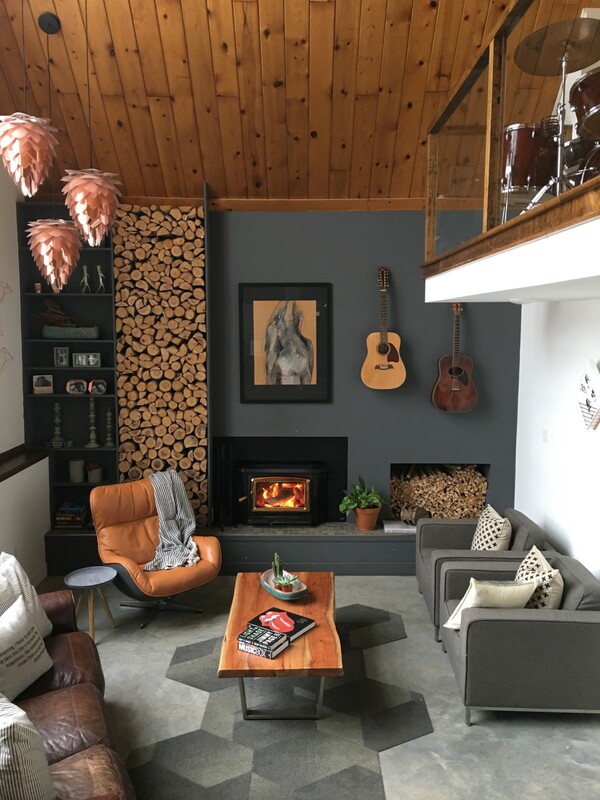 The walls were painted with Benjamin Moore Overcoat CC-544 and enlivened with original artwork by Suzanne Hill above the fireplace. This natural palette of colours and materials invited the use of retro decor pieces. Instead of putting new floors down, poured concrete polished completes this space! The living room with huge windows has an abundance of natural light for most of the day. But when the sun sets, three Vita Copenhagen Copper Conia Pendants hung in the left corner of the room offer soft lighting. Natasha has sold all but one piece of her original furniture – a brown leather couch. It’s kept its home in the living room due to the dogs! However, we complemented it with the EQ3 Arie Chair and two Gus* Modern Jane Chairs (no longer available ) . The Goods Home Colony Coffee Table incorporated more natural wood into the space. Featured above a Darren Emenau ceramic along with cushions and umbra strum shelves, all from Tuck Studio. In the front of the living room, the floor was built up to create a platformed area. By doing so, it made a small section to for Natasha’s record player and a hutch to house her and Paul’s healthy record collection. The Gus* Modern Lodge Chair was added as additional seating in this area and the Nuevo Atom Pendant was hung above it to add a modern element. Incorporating Natasha and Paul’s love for music was easy. Their guitars are hung on the wall within easy reach and some of their favourite album covers can be displayed in the Umbra Strum Shelves hung above her two Gus* Modern Jane Chairs. Updating the kitchen with a new countertop and painting the walls Benjamin Moore Oxford White worked wonders so far as addressing the oppressive darkness of her former kitchen. We lowered the kitchen peninsula to counter height and added two Gus* Modern Stanley Stools, creating a flow between the kitchen and dining areas. Gus* Modern Stainless Steel Picture Rails were added to the wall to display small decor items or art that can be switched out conveniently. Mounted above them is Umbra’s Hexy Wall Decor. As the dining room relies on the natural light that flows through from the kitchen window and living room doors, we added the Nuevo Shai Pendant above the table to ensure everything was appropriately lit when the sun went down. Repositioning Natasha’s existing dining table and pairing it with new and lighter chairs (Pink & Brown Bert Chair) opened up the dining room. Disco balls were added to the table as a funky (and relevant!) centrepiece. Paul’s drum set now makes its home in the corner of the loft and is visible from the living room. This is especially convenient for when the family is together and playing music! Ceiling pendant: Vita Silvia The sides of the loft were painted with Benjamin Moore’s Oxford White to open the space up. JFFabrics Spring Garden wallpaper was chosen for the back wall of the loft because of its geometric accents. As this space was right above the living room, it was also blessed with an abundance of natural light from the front window. The previously panelled floor was replaced with tile for an easily maintainable option for the family. The Gus* Modern Lightbox and Pawn Stool were chosen to act as accents in front of the sofa. A few Pony Rider (The Seeker Cushion / Tee Pee Dreaming Cushion) cushions decorate the sofa and more of Natasha’s records were framed with Umbra’s Record Frames and hung on the wall for that added personal touch. However, the best seat in the house is reserved for Chewy! The upstairs bathroom was updated with simpler light fixtures and paint, making the space feel bigger and brighter. Mounted above the mirror is the Nuevo Elsa Double Sconce and the Vita Eos feathered pendant is hung from the ceiling. The tile was removed and replaced with wooden panelling, and the walls were painted white. As with most of our posts, we encourage sharing if you feel so inclined! Either share this post through Facebook, Twitter or Instagram and your name will go into the draw to win all of the items shown above. Can you spot them hidden in this reveal? The prize includes: x1 Wanted and Wild Cushion ($55), x2 Umbra Copper Strum Shelves ($15 ea), x1 Umbra Hammered Head Corkscrew & Bottle Opener ($20), and x1 Umbra Jacks Ring Holder ($8)! All of these items have a TOTAL VALUE OF $130!